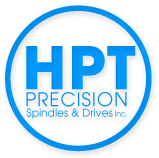 HPT Precision Spindles & Drives Inc. is your exclusive and authorized source of certified precision drive systems for CNC and robotic machine tool installations, test cell motor drives, and demanding motor drive environments, such as vacuum, contaminants, etc. We’ve been providing proto-type and production quantities since 1970. Our precision spindles are used in machine tools and are the “hearat” of a CNC Machine. Industries served scope all corners of the manufacturing industry, including aerospace, auto, dental, and medical manufacturing. HPT also supplies the highest quality ball and roller bearings with outer diameter ranges from 40 mm to 1600 mm. Custom bearings are available in a diverse range of dimensions and quantities. Contact use for all available options. HPT offers the finest spindles, precision drive systems, and high-precision motors from BMR, IMT, SLF, W&H and Zwanzig. Custom spindles are also available. Copyright © 2015 HPT Drive Systems, Inc. All Rights Reserved.